Sukkot, a Hebrew word meaning “booths” or “huts,” is the third of the Jewish Pilgrimate Festivals. It consists of our giving thanks for the bounty of the fall harvest,as well as the commemoration of the forty years of Jewish wandering in the desert after Sinai. Sukkot is celebrated five days after Yom Kippur on the 15th of Tishrei and is marked by several distinct traditions. One tradition, which takes the commandment to “dwell in booths” literally, is to build a sukkah, a booth or hut. A sukkah is often erected by Jews during this festival, and some eat and even live in these temporary dwellings during Sukkot. Read more about the history and customs of Sukkot. This year, Erev Sukkot falls on September 23rd. We will raise the Sukkah at 10 AM and celebrate the newly raised Sukkah with Sauvignon and Soda in the Sukkah at 5 PM. Our children help to decorate the Sukkah and enjoy a snack in its shade during Religious School. 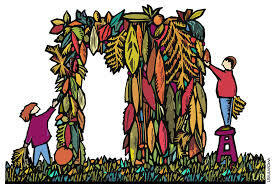 Our Oneg on Erev Shabbat takes place in the Sukkah and we use every opportunity during the week long festival to celebrate outside, as did our ancestors in Biblical times.